Explore the North Shore's many beautiful scenic lookouts, cultural/historical sites and finish the day on the iconic north shore of O'ahu on this private 6-hour tour. Your tour guide will pick you up from your hotel on Oahu and transport you to the various sites in a private vehicle. See sweeping views of Diamond Head, a Buddhist temple, and stop for a delicious lunch (at own expense). Most tours begin at 7am with pickup from your hotel or a location close by. Begin the tour with a scenic lookout with sweeping views of Diamond Head and the city below. Then, head to a historic location which offers views of the east side. Then, head up the east side and stop off at a beautiful, Japanese Buddhist temple. Then, pass the area where Jurassic Park was filmed and stop off at a beach park just across the road with views of the famous offshore island known as Chinaman's Hat. 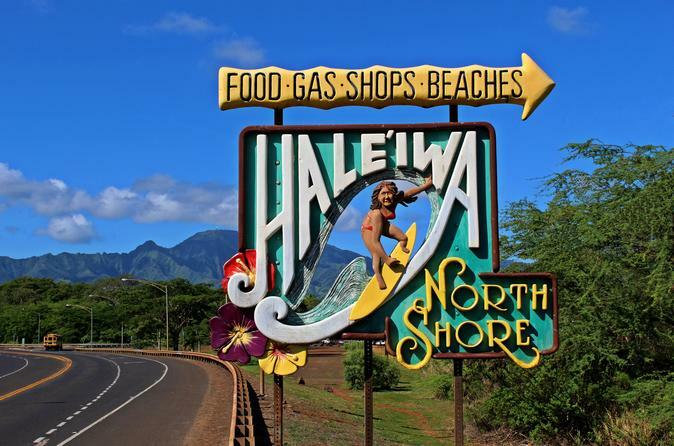 Stop for lunch (usually at a shrimp truck; at own expense) and then continue up to the iconic north shore of Oahu. Pass by the famous surfing beaches and then head up to a beautiful lookout just above the famous Waimea Bay. Our tours are flexible and care is taken to accommodate your interests and move at your pace.